Yael just turned one year old last August 7th and he has grown so much! Time flies really fast and here I am with less cuddling and more of running after my baby. 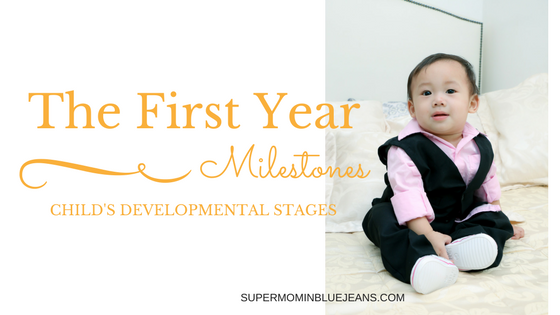 Of course, every child is different and they have their own unique way and time to develop but have you ever wondered if your child is within his development milestones? Let us find out altogether here mommies and daddies to ease all our minds. Doctors and nurses will check certain milestones for your child during routine checkups and if your child is meeting the milestones, that means he is on track. But if he is not and or reaches a milestone but loses an ability that is the time he may need special help from a doctor or child specialist. In my case, Yael is an early crawler and walker. On his fourth month, we noticed that he is crawling a lot and can hold up his back and can sit up already. He was drooling a lot that time and I thought it was because he is teething but guess what, he was late in developing his teeth. His first tooth was out two weeks before his first year. But before Yael turned one year old, he started to walk on his own. While my friend who has a baby two weeks younger than Yael shared her child’s development with me. At four months, her baby has two teeth already, just started to crawl before his first year and still practicing to walk. So, it is really different. Each child grows and gains skills at his own pace. Some can be advanced, but behind in another. The soft spots or fontanelles started to close or close completely. Between 9-12 months, most children by age 1 have tripled their birth weight. Measure somewhere between 71 cm (28 in) to 81 cm (32 in) in length. Have grown in head circumference 46 cm (18 in) between the 9th and 18th month. Got a few teeth and usually the first to come in are two upper or lower front teeth. Curious about things and objects as they will try to push the knob, hold things unusual to them sometimes eat them! Pushing buttons, opening drawers and cupboards. Started to remember things that happened everyday like if your husband will go to work he is used to waiving goodbye and giving him a flying kiss. That is retained and he will do that almost every day. Your child is determined! He can find the objects that they watch you hide. For example, you hide the teddy bear put it somewhere in your blanket, he will still try to find it by removing the blanket. Likes to play peekaboo a lot and some children are used to say hi, hello or waive to strangers. Interact mostly with parents or primary caregivers. Some children usually don’t like to play with other children especially if they don’t know them. But they do engage in “parallel play” wherein they play alongside each other but don’t interact. Develop separation anxiety. They protest when someone leaves them. If one parent is leaving or any other primary caregiver, they will cry so hard, cling to parents while leaving. But at the same time understanding permanence – that people and objects still exist even when they are out of sight so they can easily recover after the crying moments. They also shows pleasure and get excited when the parent or primary caregivers return to home. Enjoy games such as peek a boo and pat a cake. The perfect little sound imitators. They repeat the sound right away whenever they hear someone is talking. Recognize their own names and even the names in their household and pets. They begin to typically understand some familiar words and gestures. Likes to put things in their mouth and this is their way to find out what the object is. Pull up to a standing position while holding a furniture or toy with his hand. If you want to know more about your child’s developmental milestones, you can print it here or download this link for your reference from the CDC (Centres for Disease Control and Prevention). This guide is essentially made for parents like you so you can look inside for milestones to watch for in your child until 5 years old and how you can help your child learn and grow. Also, you can check the milestones your child has reached at each age. Take this with you and talk with your child’s doctor at every visit about the milestones your child has reached and what to expect next. Lastly, enjoy every moment because they grow so fast! Please feel fto commentment below or share any topic you want with regards to your child’s development.